This picture has now been identified. Jurgen Hinz and Anna Peters Hinz children. You can read about this family in the Manning Centennial book by clicking on "Manning Family -- H 306 - 322. 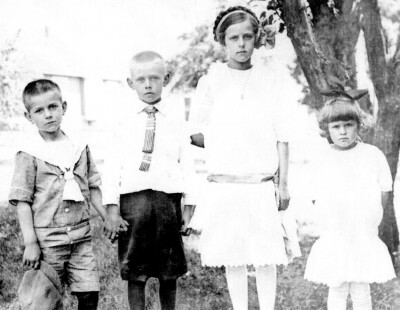 I was told that this picture is of Edward Hinze and maybe his brother and sisters. But I also have been told that it is not. Edward Hinze was the son of Otto Hinze and Marie Rohde. He had two Brothers Albert (Pat) and Walter. 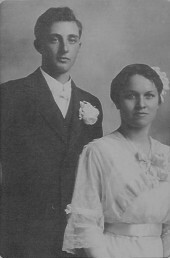 Two Sisters Martha (Married) Adolph Hugo Grundmeier & Erna Hinze Sanks. Edward was married to Anna Hell and had three children; Roy Otto, Glen Carl and Velma Mary. Otto died in the Home of his daughter Erna in Carroll in 1914. Marie Died in Manning on June 26 1908 after that a girl by the name of Laura Popp did house keeping and child care for Otto. Otto moved to Iowa with Charles Hinze from Chicago. Otto was a cousin or nephew of his. Grand Ma Anna (Hell) Hinze worked in the hospital for many years. Grand Dad Edward Hinze worked at the creamery, on the railroad and as a farm hand. I have not found much about my father, Glen Hinze's school days. Great Uncle Albert (Pat) Hinze lived around there and then moved to Carroll and worked on the Railroad until retiring in Carroll. Please e-mail Glenda Begnoche or Dave Kusel if you have any Hinze information.